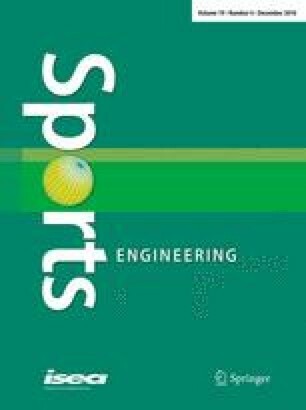 A study has been conducted to review viscoelastic and foam-constitutive models to describe sport ball response to impact with a rigid cylindrical surface. The impact model was developed to simulate a ball–bat collision. Comparisons were made to actual impacts, utilizing displacements recorded and analyzed using high-speed video capture. The resulting images and the ball geometry before impact were used as input to a computer-vision algorithm, which then produced a quantitative description of the deformation during impact. Foam-based material models were observed to match this observed deformation better (within 1 %) than viscoelastic material models (within 5 %). Both viscoelastic and foam material models deviated more from experimental data when describing dissipated energy and stiffness than when describing deformation. When describing impact energy dissipation and ball stiffness, the viscoelastic models deviated from experiment by more than a factor of two, while the foam material models exhibited up to 35 % error. The measured ball deformation, afforded through video analysis, has shown that foam material models are better able to describe ball impacts involving large energy dissipation, but require further refinement before equipment performance and design can be reliably performed.